It is equipped with an automatic setting function of grinding and dress condition which sohrten the data input with a graphical screen display. ・The CA-iQ series was equipped with an automatic data making function in a surface grinder for the first time. Input Total stock removal and Fine Stock removal, and input wheel grid size, then can make the most suitable grinding condition and dress condition. ・Adopted V-V slide way system for excellent straightness and T-shape frame integral structure is no-overhang ,Wide open table loading area by Column traveling type of machine is easy large size of workpiece. Adopted double cylinder system increase table loading capacity Since there is no overhang work setting area from even table full stroke which is providing more stable process. ・Selectable for various grinding mode such as Surface grinding, Pitch grinding, Contouring grinding and Formed grinding. ・Further reduce cycle time by overhead dresser as option for Coarse grinding and Fine grinding with Table mount dresser. ・Hydrostatic slide system as an option, also available with high accuracy mirror finish. IQ operation that enables easy grinding. Equipped with high level of technology from many years experience for special purpose machine. Offer to the simultaneous 2-axes / 3-axes control applications and index work, automatic measurement system. ・Overhang less T-shape rigid frame and crossfeed, vertical guide adopted linear roller guide, Longitudinal guide is in response to the application V-V or linear roller guide (optional). Longitudinal drive system adopted hydraulic cylinder drive system and stable accuracy due to no overhang of workpiece even table full stroke. ・Having high accuracy positioning for Vertical and cross axis which can be use complicate form work together with many experience We will offer best system for you. ・To using 2-axes simultaneous control, machine can using like precision form grinding machine. We will suggest best application to suit your workpiece. PSG-CA2 series specifications will be different by workpiece, please contact local sales office. Simultaneous 2-axes or 3-axes control CNC and table ball screw drive is able to have on machine measurement and versatile grinding process. ・Overhang less T-shape rigid frame and crossfeed, vertical guide and table longitudinal adopted linear roller guide with ball screw drive. ・Automatic surface grinding cycle, shift plunge grinding ,traverse grinding ,multi-position grinding ,crowning grinding ,taper grinding ,high-speed grinding /slow-speed creep grinding is possible. Also possible have index work by add index device as options. ・Table mount three-direction dresser is standard, rotary dresser and swing type universal forming dresser also available as option. ・Adopt table ball screw drive is possible to measurement by touch probe or CCD camera for measure the shape without remove workpiece from machine. ・Simultaneous three-axes control is possible as well as form grinding.Offer suitable application depend on workpiece. 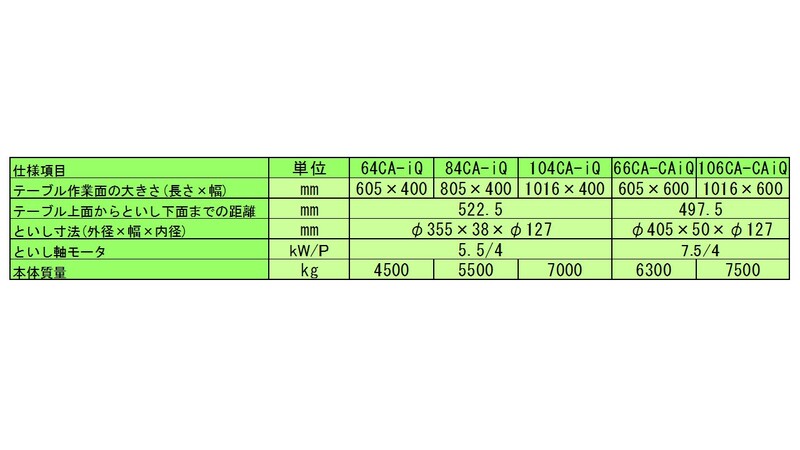 PSG-CA3 series specifications is different on workpiece, please contact to nearest sales office. To achieve precision surface grinding and form grinding by column type, high rigidity and closed-loop control system. ・Adopt a high-rigidity column traveling type in a small CNC form grinder. 2.1 times the mass than old type machine.Over-hang-less design for longitudinal, Damping of the vibration is high level, and obtain stable grinding accuracy. ・Based on our long time experience and knowhow build up conversational type software work for Pitch grinding, Complex grinding, Contouring grinding.Provide Vertical and Cross axis closed-loop control as option for high level of pitching job. Equipped with an automatic setting function of grinding and dress condition, saving of the data input time by graphical screen display. ・There is no character in the operation screen. Easy operate on touch and input. ・CA-iQ series mount automatic program making function in Surface Grinder for the first time.Only input Total stock removal amount and grinding wheel grid, then make in suitable grinding and dress condition in automatically. ・Possible to have Surface grinding, Pitch grinding, Contouring grinding and Formed grinding, such as a variety of grinding method. Precision mold parts and jig parts can be grinding in high accuracy. ・Abundant experience like a Slit grinding for Rotor, Index grinding for Coupling, Radius from grinding for Vane pump, Inner boll groove grinding by vertical spindle, Screw thread Die grinding, 2-Surface square up grinding and End sealer grinding. ・Conversation type Graphic software provided Pitching grinding, Step grinding, Form grinding and Free Form grinding. Also we can offer macro program to suit for the customers. ・Provide various type of dresser unit for every process by NC Overhead dresser, Table mount 3-direction dresser, Swing type dresser and Rotary dresser. ・Correspond for Form Grinding by Longitudinal and Vertical axis simultaneous control.Suggest most suitable application for each workpiece. Widely size line-up as basic machine from Mass production or Order made specification machine. Suggest most suitable application from our abundance experience. ・Own developed control system operate from Coarse grinding ⇒ Fine grinding ⇒ Spark out ⇒ Table right end stop in automatic cycle. ・Difficult grinding material or Very hard material have dress interruption during automatic cycle often, easy to correct dress interval or Air cut amount. 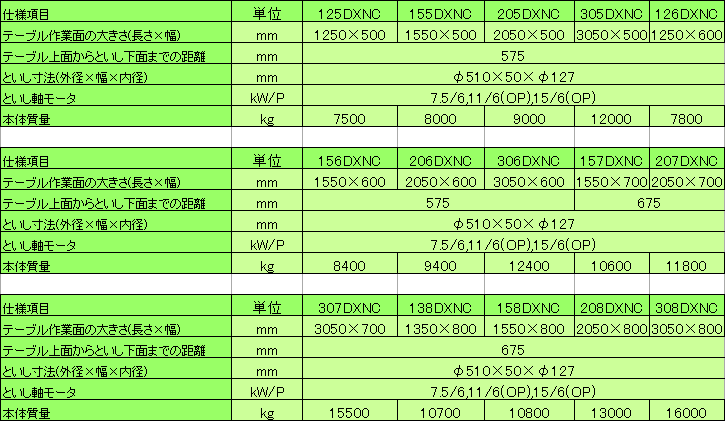 ・DXNC series, it is possible to perform the following grinding in order made specification. [High-efficiency grinding], [On machine Measurement], Multi grinding], [Variable input by macro program] those combination to correspond various application. Own developed Variable Pressure adjust type Hydrostatic slide system and Ultra precise temperature control technology achieved more cross to ZERO accuracy. ・Most important point is Minimize Table float amount, also table reverse point keep the same height to contacting workpiece surface for improve surface finish.Variable Pressure adjust type Hydrostatic slide system is able to keep constant amount gap in all work area and strong rigidity. 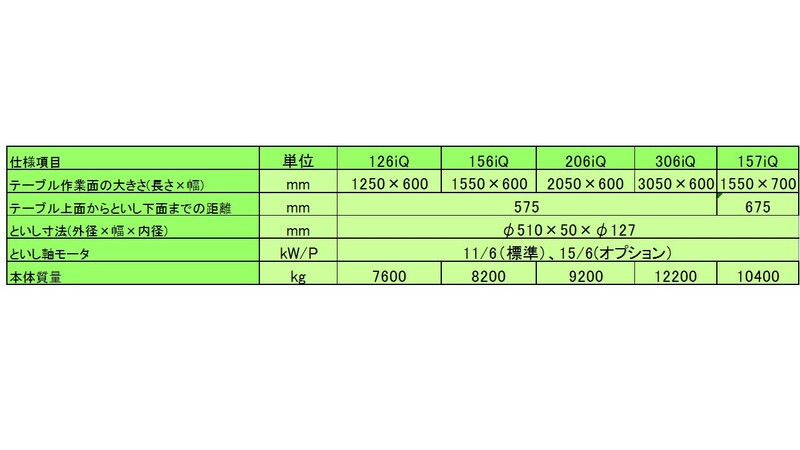 ・Correspond straightness accuracy for Cross axis 0.4μm/800mm, Longitudinal axis below 0.5μm/m(UPG408NC). ・Ground same workpiece location Left side of table, next Center of table, lastly right side of table, 8-point measured flatness on each time each position achieved within 0.5μm, The system certified for strong against unbalanced load.